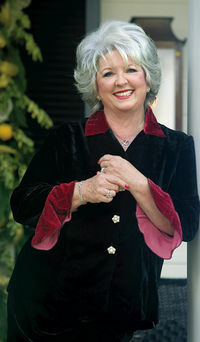 Paula Hiers Deen (born January 19, 1947) is a chef, restaurateur, writer, and TV personality who lives in Savannah, Georgia. She owns The Lady & Sons restaurant in Savannah, and runs it with her sons, Jamie and Bobby. She has also published four cookbooks. She is known for rising from the adversity of divorce and agoraphobia to become a successful businesswoman. Her bubbly, "down-home" personality makes her a favorite among TV viewers. She was previously a homemaker and a bank teller, born in Albany, Georgia, and is a notable graduate of Albany High School. She divorced her first husband in 1989 soon after moving to Savannah and was left alone with US$200 and her teenage sons. She was a proficient Southern cook, so she parlayed that into a clandestine catering service. She would make sandwiches and other meals, and her sons would deliver them due to the fact that she suffered from agoraphobia, a fear of public places. The Bag Lady, as the business was named, was wildly successful and soon outgrew her kitchen. She was hired by a Best Western hotel in Savannah to cook meals, where she worked for five years before opening her own restaurant, The Lady and Sons, in Downtown Savannah. She overcame her agoraphobia by interacting with customers she previously only spoke to on the phone. Within a few years, the restaurant moved to a larger building in Savannah's Historic District. In 1997, Paula self-published The Lady & Sons Savannah Country Cooking and The Lady & Sons Savannah Country Cooking 2, cookbooks filled with all her own recipes. They were very successful as well, and she has since published two more. She has appeared on QVC many times, and went on The Oprah Winfrey Show in 2002. Deen's relationship with Food Network began in 1999, when a friend introduced her to Gordon Elliott. He took her through the city doing a series of Doorknock Dinners episodes. She would also appear on Ready, Set, Cook!. She got her own show, Paula's Home Cooking, in 2002. She remarried on March 6, 2004, to Michael Groover, a tugboat pilot in the Port of Savannah. The wedding and preparation were documented by Food Network and aired later in 2004. Paula made her film debut in Elizabethtown, starring Orlando Bloom and Kirsten Dunst. In the movie, she plays the aunt of Bloom's character, and her cooking is showcased heavily. The film premiered on October 8, 2005. A special, Paula Goes Hollywood, premiered on Food Network in conjunction with the film's premiere. Following the example of other Food Network chefs, Paula launched a lifestyle magazine called Cooking with Paula Deen in late 2005. Paula's Home Cooking was being taped in Millbrook, New York(according to her magazine's debut issue), at the home of Gordon Elliott, the show's executive producer. Paula mentioned in an interview aired on the March 13, 2006 edition of The Daily Buzz that the next batch of episodes of her show will be taped at her home in Savannah, Georgia. According to the first of those episodes, actual production at her new Savannah home began in November 2005. A televised biography of Deen was aired on an episode of the Food Network's Chefography program in March, 2006. Paula's also has a show entitled Paula's Party that started broadcasting on the Food Network in the Fall of 2006.